For those of you who don’t follow Hayes (Scriven of the Northfield Historical Society) on Twitter, late yesterday he posted a question. 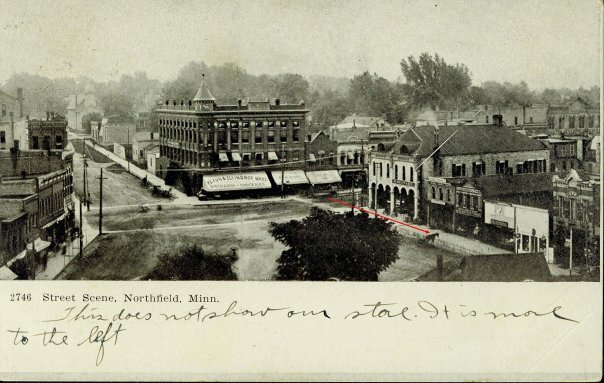 He wants to know if anyone can tell him the height of the sidewalk (marked with the red arrow) in this cool photo (click on photo to enlarge) from the Historical Society’s archives. Know the answer, contact Hayes. I’m sure there’s a nifty prize…or at least he’ll buy you a drink at their upcoming auction. I think I can come up with a nifty prize for the winner! It appears to be shoulder high to a horse which, depending on the breed of horse, is about 42″. That looks a lot like Dan Freeman’s horse. Ask him. Check out the discussion on this photo on our facebook page! I don’t know the height of that curb–but I do know it was common for the height to be about 24 inches so that you could get in and out of your buggy without using a step stool. In 1996 they tore the old curb out at 309 Railway St in Dundas–and that one was about 24″ and dated back to the buggy days. It looks to me like there may be a fence along the sidewalk, that gives the appearance of a ledge along the edge of the walk.